Downtowns—like it or not—are epicenters for cities on a multitude of levels: they are (or at least should be) economic powerhouses that provide jobs, housing, entertainment, and cultural assets. After all, half the world’s population lives in formal cities that account for 80% of the GDP. In this sense, as urban planner and economic developer John Karras pointed out, successful downtowns are about growth and diversity—not just growth. So why isn’t Long Beach’s downtown joining the top 20 cities that are, when analyzing population and job growth, cultivating prosperity? This is a pertinent question when one takes into account that middleweight cities*—just like Long Beach and Houston and Austin—are poised to deliver 40% of the global’s growth come 2025. And, of course, my explicit endorsement of making downtown flourish. In fact, between 2000 and 2010, our downtown’s job sector grew by 7.4% while its population grew by 9.3%; both numbers are respectable—hey, we grew and that’s good, right? But if we just look to our neighbors to the north in LA, we shrivel: Los Angeles grew by 14.2% in jobs and 26.9%in population. San Francisco? 20.1% and 41.5%. Both LA and San Francisco join Fremont (yup, Fremont), Sacramento, San Bernardino, and San Diego as California cities joining the top 20 in the nation. Even more, Long Beach’s mean center of population—what Karras calls the “center of gravity”—has shifted away from the center of downtown. This is unlike, say, Portland, whose center of gravity is .06 miles from the center of its downtown, encouraging an urban vitality that promotes growth. 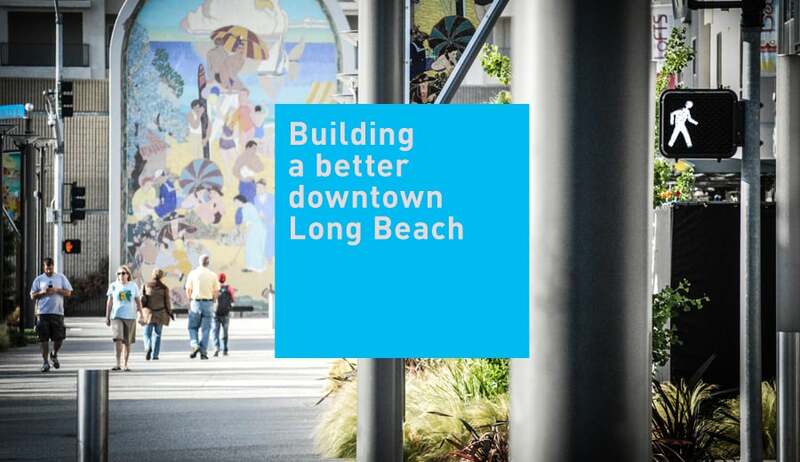 So how do we make a better downtown Long Beach? And what do we do that we need to continue doing because it is great for our downtown? Let’s start with what we need—and first and foremost, that’s simple: get rid of the one-way streets. As urban planning shifts toward making space for people rather than cars, the need purpose of two-way streets becomes even more pertinent: even though two-way arterials lower moving vehicle capacity, they increase pedestrian safety, increase property value, lower trip times (particularly for visitors who mindlessly circle around not knowing where they are going), and negatively affect the environment according to The Center for Sustainable Urban Neighborhoods at the University of Louisville. Secondly, give more public land that isn’t being used—*cough* Art Exchange *cough*—to the private sector world. Trust me, if Portland can turn an elementary school into a dining and beer hub and Austin can turn a former power plant into a massive urban development, Long Beach can open up its opportunities as well. Hello, Edison Lofts! The need for park space is an understatement—and as much as I love the idea and philosophy of Harvey Milk Park, the word park should be put in air quotes. Downtown needs more play space not just to welcome families and active folks, but simply bring people together for the simple act of relaxing. Turning the Shoemaker Bridge into a park? Yes. Removing part of Terminal Island Freeway to make a park? Yes and more yes. Reduce parking downtown. There. I said it. Downtowns are meant to be walked—and it would behoove our city to adopt plans (like Austin and San Francisco) that abandon parking minimums. If a city is more brazen, like SF, they can move toward implementing parking maximums for developments. Three words: bike share program. Three more words: where’s Bike Nation? Oh, and three more words: the Blue Line. Additionally, why doesn’t Cal State Long Beach have a presence downtown? It is odd that CSULB has no downtown connection. Dorms? Research labs? Hell, CSULB graduates more art students than any institution west of the Mississippi. Studio space, perhaps? These suggestions are, of course, not the only things we can do nor are they necessarily inherently bad. After all, we are doing things that, according to Karras, are the precise keys to growing downtown. And we need to keep doing them. We are caring about our history more. Unlike the disastrous destruction of Pine and Ocean as our pedestrian hub of the hey-day, the restoration of the Press-Telegram Building and the Meeker-Baker building for Molina Healthcare has proved that we won’t make the same mistake twice. The LBCC Small Business Center is phenomenal and provides a hub for small business that make Long Beach run (put that in your back pocket, Chamber of Commerce, an institution which still doesn’t offer small businesses a place on their roster at a discounted price. Because, y’know, Lord Windsor is just like Toyota of Long Beach). Our dining and entertainment district (DED) is identified and established—and it’s being used. Between the coolness that is the Promenade, places like Federal Bar, Bo-beau, and Hamburger Mary’s having moved onto Pine, and the creation of more ped friendly spaces, our DED is shaping up to be as awesome as it should be. Are we doing some things right? Of course we are. But that doesn’t mean we can’t do better. *The McKinsey Global Institute defines a “middleweight” city as one with a population between 150,000 to ten million inhabitants. Often, Los Angeles is combined with Long Beach and Santa Ana as a single “market;” for obvious reasons, this is both a good and bad thing.